If you know your way around historical landmarks, you would definitely have heard of Mont Saint Michel. Located in Normandy, France, this island commune has been bestowed with the privilege of being named as one of UNESCO’s World Heritage Sites because of its rich history. Now, Mont Saint Michel has achieved another milestone to be cherished - one that would have come to the surprise of unsuspecting visitors. After all, who would have thought that a place with a prominent place in history could bring you the future of tiny living? Sebastién and Christèle Bernard certainly did. 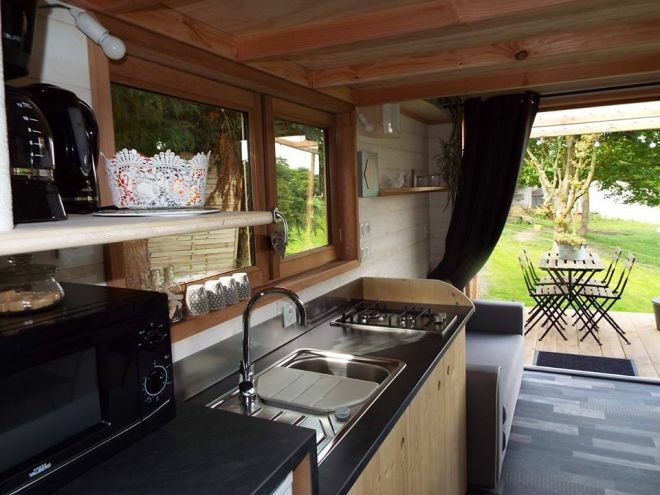 The entrepreneurial couple teamed up with France’s first tiny building company, La Tiny House, to create a unique hotel experience for Mont Saint Michel’s visitors. 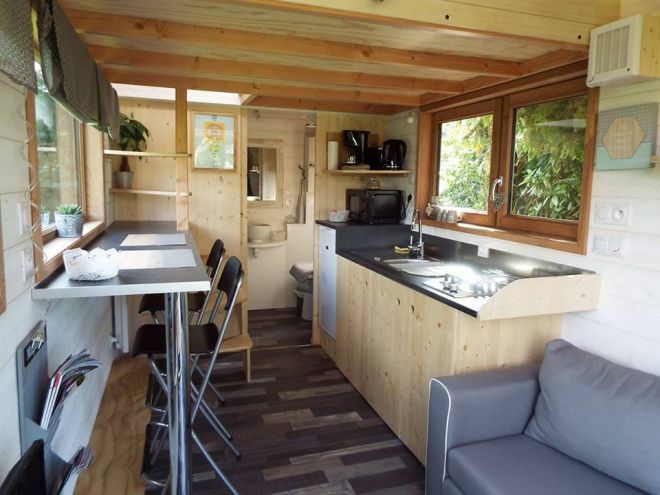 The result was a beautiful tiny house on wheels, designed to be the ideal retreat for couples and small families. This tiny hotel has enough room to comfortably accommodate two adults and two children, and is sure to satisfy the wanderlust of all Francophile tiny house enthusiasts. 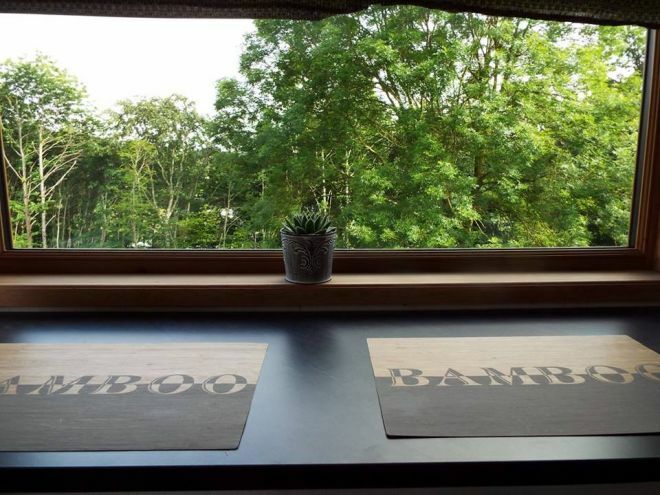 Come and see how the French experience tiny living in this gorgeous little Normandy hotel, and be amazed by picturesque views that come with a fully functional and compact little getaway. 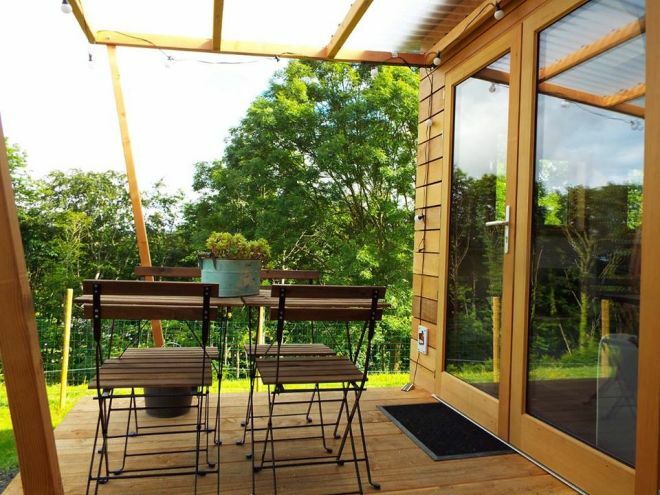 Visitors to this tiny accommodation will be welcomed by a stunning balcony that entices anyone to sit back and enjoy the outdoor scenery. A rounded roof gives the Mont Saint Michel house a modern artistic flair while the wooden exteriors bring traditional elegance to this beautiful wheeled abode. We all know that the French are connoisseurs of all things chic, and this tiny hotel stays true to this tradition. The spacious wood and glass doors are visually alluring as well as a great source of natural lighting to the interiors. Note the combination of wood and aluminum on the siding. Another great addition that helps to create a modern, yet prestigious, feel for this unique little cabin. 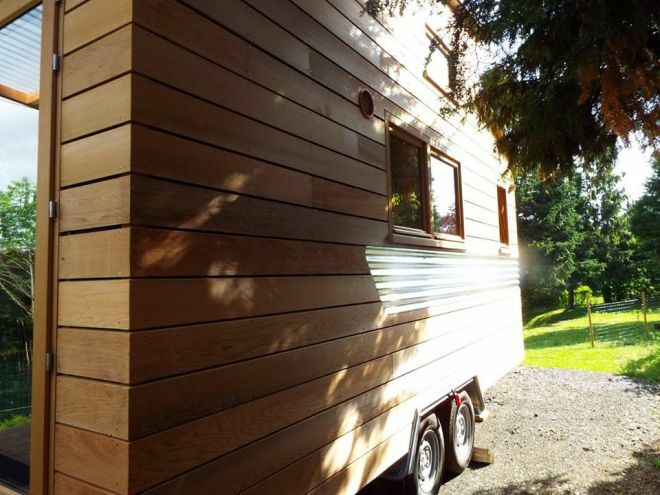 This tiny house has a 20-meter-squared (215-square-foot) overall surface area. 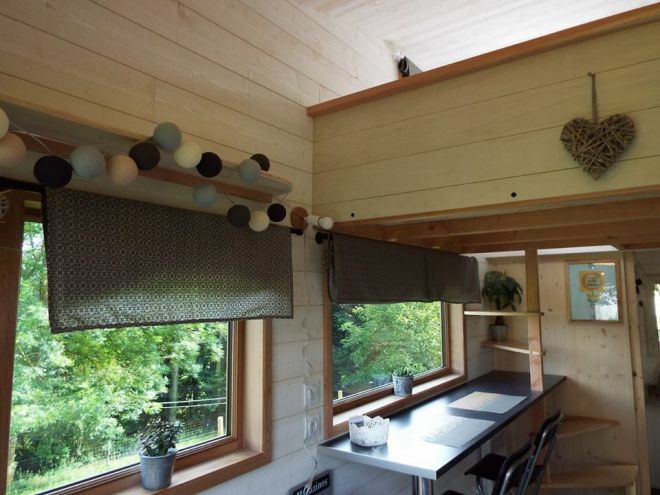 For aspiring tiny home buyers, it may interest you to know that La Tiny House actually offers this house design as one of its 3 custom prefab options. Inside the Mont Saint Michel treasure box, you will find a couch with a pull-out bed, all your living essentials, and plenty of space to sit back and relax if you prefer to stay indoors. Here is a look at the fully equipped kitchen. There is a fridge, a microwave, 2-burner stove top and plenty of kitchen utensils to satisfy your culinary needs. Straight ahead of us is the bathroom, and if you look quite closely you will see something else concealed in open view. All of the La Tiny Houses come with their own bedroom loft areas, and this Mont St Michel hotel is no different. Focus your attention to the left of the bathroom, and you will encounter a discreet staircase leading you into your own secret sleeping spot. But we are getting ahead of ourselves, so let's refocus on the essentials. 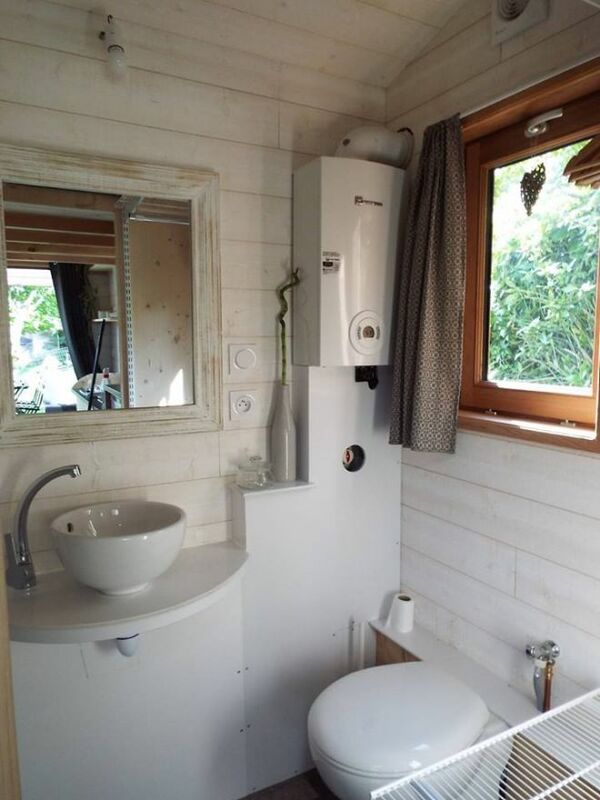 The bathroom is well-equipped with a composting toilet, a basin, an 80-by-80-centimeter (2.6-by-2.6-foot) shower, and is well served with hot water through a gas heater. 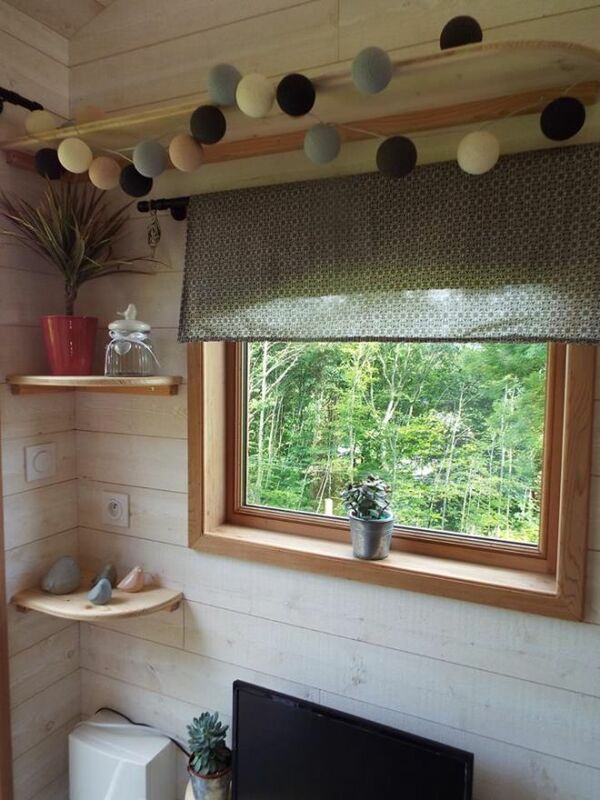 As you can see, like any other tiny house a lot of attention has been paid to the functional details. But really, in this Mont Saint Michel marvel it is the tiny pieces of decor that bring everything into perfect harmony. From solo miniature potted plants, contrasting with larger windows. 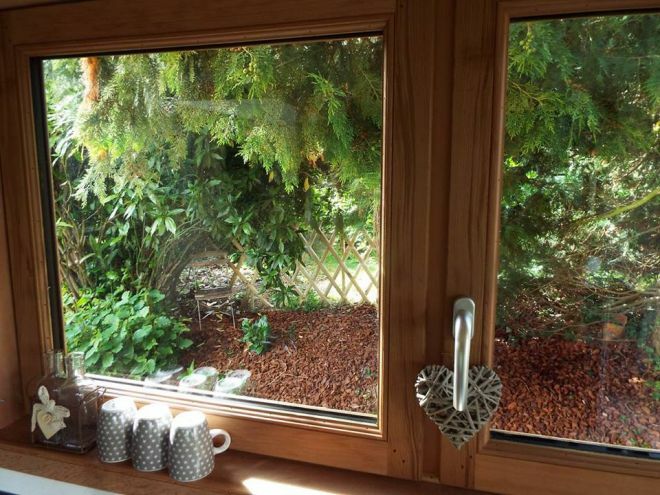 To the added stones, plants and jars that are cleverly scattered around the window sills, tables and shelves. And plenty of little adornments that give this exclusive vacation spot a wholesome, homely, feel. 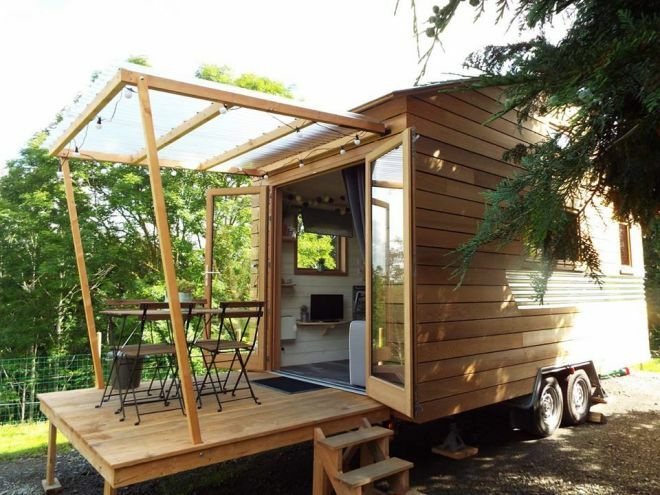 With this tiny wheeled hotel, everything is set for the ideal French vacation. 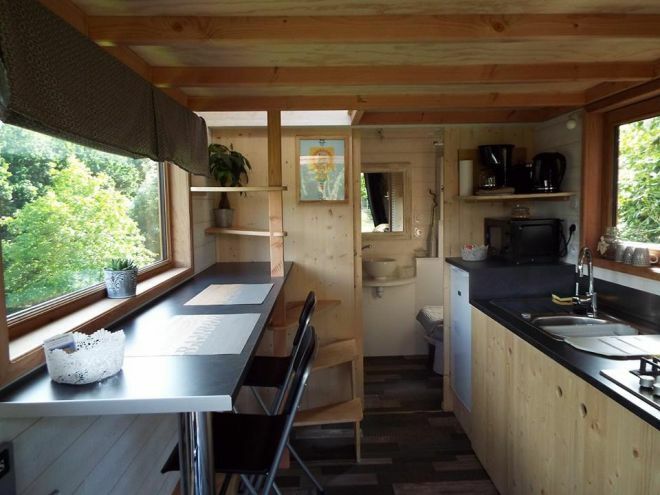 The Mont Saint Michel tiny house is a great getaway that is sure to make visitors feel right at home, helping them embrace a greater sense of joie de vivre.